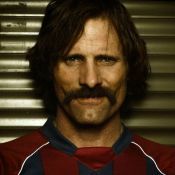 Viggo Mortensen sounds tired and a little peeved. He's crammed this interview into his schedule first thing this morning, but a minor family emergency has intervened. Now, a couple of hours later, his thoughtful, deliberate, slightly nasal drawl is accompanied by intermittent rushing water and clinking plates; it sounds like he's doing the dishes. And that's a bit incongruous. 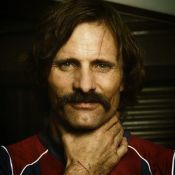 Mortensen was named one of People Magazine's 50 most beautiful people in 2002 after his star turn as Aragorn in the Lord Of The Rings trilogy; he's now come into his own with an intelligent, subtle and gripping performance in David Cronenberg's impeccable A History Of Violence. Mortensen's an avid horseman and world traveller, an accomplished poet, painter and photographer, and he owns a small press specializing in photography and poetry and the occasional children's book or collection of essays condemning the occupation of Iraq. Normal daily tasks like looking after his son and doing the dishes seem almost beside the point. Of course they're not, for Mortensen at least. But it's not easy being a Renaissance man when you've got hordes of fans, a publicity campaign to support and a family to attend to. "Being a celebrity made it a little odder if I had a show of photographs or a book signing or something. A lot more people showed up because of the fleeting notoriety that comes with being associated with a box-office success." It got to the point where he stopped doing book signings, because an event that should have taken an hour wound up taking up a full nine hours of his time. "So I thought, 'Well, what's a signature anyway? I'll just make things when I can, and if people are interested in them they're interested in them. '" He says he also decided not to try to do 20 movies and become as famous as humanly possible and make all the money he could get his hands on. "That would have been an option some people might have chosen. It's not better or worse; it's just whatever you're into. "I've been really busy, and I'll probably always be really busy, because I like making things. But there's a relaxed way to do it and there's a frenetic, by-the-seat-of-your-pants way to do it. I think something that's meticulously prepared, but in a relaxed way, gives you better work in the end. "Like David prepared this movie, and allowed us to prepare ourselves." His voice changes as he mentions Cronenberg - he perks right up. "I can't ever remember feeling as in step with a director and having such a consistently easy and enjoyable time communicating," he says. It wasn't just that they had compatible work ethics; they also shared an appreciation for the bizarre and grotesque. "Something odd would happen, even terrible, during the shoot - some effect he'd planned that turned out really well, maybe - and he'd get this look on his face of glee." He guffaws. "You'd see his reactions and think, 'Ah, what a sick man!' I remember laughing quite a bit, and that was in large part due to him and his keen and ridiculous sense of humour. "And of course, when someone is clearly enjoying himself it's infectious, and it's also relaxing. You're able to take more chances and puzzle your way through some of the obstacles more easily. He's extremely collaborative with everyone. There's a reason why people work with him time and time again." It may also be because of the results. "With other directors' movies, you're like, 'Oh, nice shot! Look at that explosion! Nice.' You get distracted by craftsmanship. Watching A History Of Violence for the first time, even though it's extremely well crafted, I didn't feel that way. I felt immediately a little bit uncomfortable: what is the tone of this thing? Do I like this? Is this actually okay? "I mean, I know it's Cronenberg; it must be good. And then a few minutes go by and you stop thinking about that - you get sucked in by his odd and uncomfortable but still naturalistic quality." A History Of Violence has been called Cronenberg's most mainstream film (see review, this page), and that may be true in a sense. While it contains all of his signature reality-bending and ambiguity, it takes place under a smoother, more conventional surface than usual. There are no Mugwumps, no technologically engineered alternate virtual-reality universes. There's little overt visual weirdness. "The people look normal enough, the dialogue is almost banal sometimes, small-town, just normal chit-chat, but obviously, between the words and connected to these words, there's a lot of other stuff going on." Mortensen sees Cronenberg's strategy as a deconstruction of so-called normal life, a way of revealing the structures we build into everyday life to give ourselves some sense of normalcy. Cronenberg's point, he says, is that we're never really safe. "The brief physical violence you see in this movie is shocking because it's done realistically, without trying to gussy it up and make it exciting. It is brutal and quick and terrible and has consequences. But there's also a sort of underlying violence there all the time, just under the surface, just in conversations between people. There's a certain violent undertone in little chit-chat at breakfast, just father-son stuff - normal things. "People as they relate to other people or to their environment are always, I think, whether they're killing flies or spraying weeds, you know, cutting up a chicken or cutting their kids' nails or giving each other shots - whatever it is - there's always some kind of" - he bursts out laughing - "horror and brutality being exercised."